Developed in collaboration with David H. Levy, one of the discoverers of the Shoemaker-Levy 9 comet among others, the Explore Scientific 152 Comet Hunter 6" f/4.8 Maksutov-Newtonian Telescope is purpose-built to produce high contrast images with a precise focusing capability for observing everything from planets and deep-space objects, to sweeping the sky for comets. The Maksutov-Newtonian design utilizes a front corrector plate to flatten the incoming light, a rear mirror to focus the light, and a secondary mirror to direct the light to the observer's eye. This combination of corrector plate and mirrors creates a wide flat field of view with minimal edge distortion. 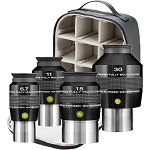 Combined with the fast f/4.8 focal ratio, it makes an equally useful platform for astrophotography or astro-imaging. The optical tube assembly (OTA) is constructed of carbon fiber to make it lightweight and durable. The carbon fiber is less resistant to expansion and contraction with temperature changes, which can cause the corrector and mirrors to shift out of alignment over time causing the scope to be incapable of producing sharp images. To assist in the alignment process and control the mount is the SkyTracker kit which includes the hand controller unit, and right ascension and declination motors. Its hand controller has more than 100,000 objects with the ability for users to input custom coordinates and favorites. With a slew speed of 2°/second and nine tracking speeds the SkyTracker can accurately keep near and deep sky objects such as the Moon, planets, galaxies and nebulae centered in your eyepiece for long exposure imaging and astrophotography or prolonged observation sessions. 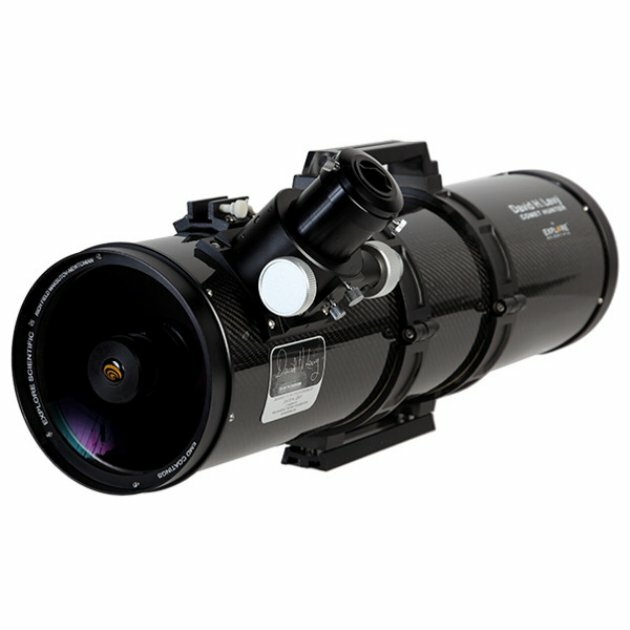 The Comet Hunter is offered here with the Exos-2 Go To motorized equatorial mount and helps to take the guess-work out of astronomy and gets you observing faster by combining an EQ mount with a 100,000+ database computer guidance system and dual-axis motors. 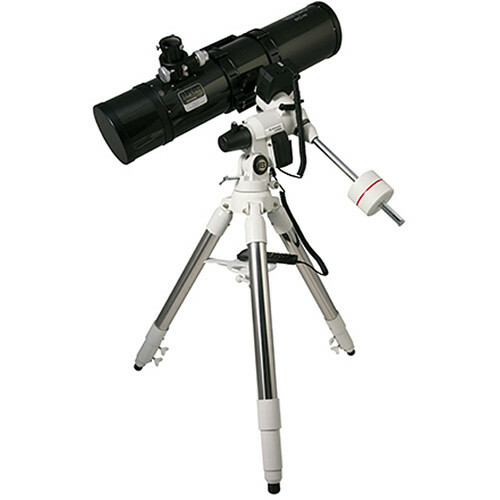 To make set-up and alignment faster and easier, Explore Scientific includes an illuminated polar finder scope for use in the Northern Hemisphere. The included tripod is built with large 2" diameter stainless steel legs and tight tolerances to reduce vibration for clearer viewing. A center stabilizer bar pulls the accessory tray up to lock the legs in place adding further rigidity and vibration reduction. It is adjustable from 29 to 49" to accommodate a wide range of users. The mounting cradle-ring assembly clamps over the optical tube and lets the user adjust the orientation and position of the scope relative to the mount to optimize viewing comfort and balancing, while avoiding interference with other equipment. 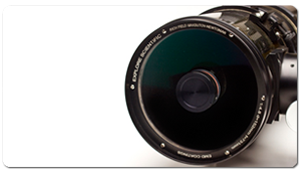 The OTA is equipped with 2" Craford-style focuser, instead of the more common 1.25" focusers typically used. Unlike a traditional rack-and-pinion focuser, a Crayford-style uses a steel rod held tightly against the focus tube. This toothless friction system eliminates backlash and enables ultra-fine precision focusing. A large coarse-focus wheel quickly brings subjects into rough focus, and then the 10:1 fine-focus allows the user to precisely focus it without the risk of losing it as soon as the knob is released. 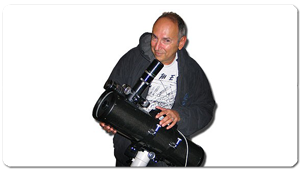 Having the ability to use large 2" eyepieces provides an expansive amount of angular view required for wide-field observations for long periods.